Transfer hotel / airport with a stop at Los Gemelos craters. (Transfer operates daily at 07h00, 09h00 and 12h00). Includes only transport. Galápagos packages and tour operations are subject to space availability. Itinerary and departure dates are subject to change without any notice according to weather conditions, logistics, and other operation requirements. Day 1 : Welcome at the Baltra airport and transfer by public buses to the tip of the Itabaca canal, where you will proceed by a public ferry service in the Island of Santa Cruz. Transport will be waiting in order to transfer you to Puerto Ayora, area where the hotels are located on the Island. 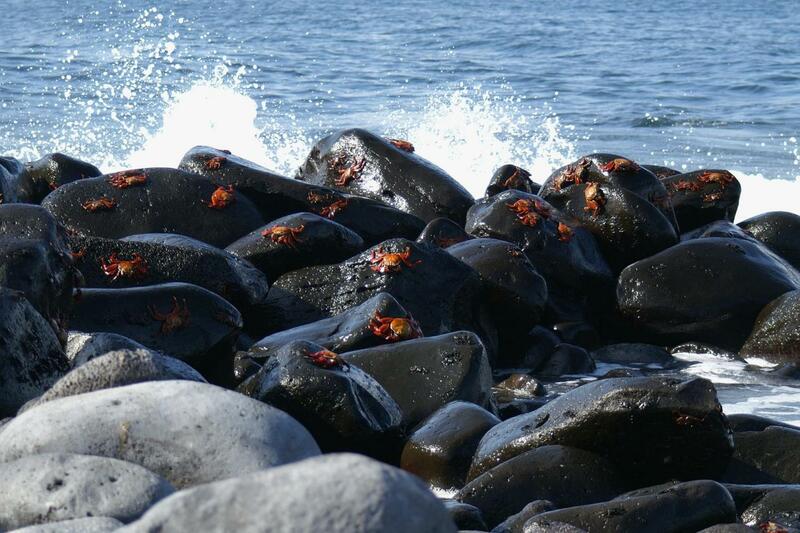 On the way, you will have the opportunity to visit the lava tunnels and a Turtle reserve. Visit to the Scientific Charles Darwin Station, where you can learn more about the Galápagos Islands; the species that live in this enchanted place, its origin, the theory of Evolution, the conservation programs, and observe some Giant Turtles in captivity. (Transfer operates daily at 13h00). Accommodation. Day 2: Breakfast at hotel. In the morning excursion to Tortuga Bay Beach, after 40minute walk (approx.) we will arrive to this magic place, one of the most beautiful beaches in the Galapagos, with white sand and green mangroves. “Playa mansa” is where we can swim and enjoy of the beach. Free time for lunch (not included). In the afternoon, tour around the bay on board a yacht, starting with a visit to “La Lobería”, named because of the presence of sea lions. Here you will be able to swim or snorkel. Then we proceed with our tour to the “Canal del Amor”, a marvelous site where nature gives us an unforgettable view; at the end of this channel, just a few meters forward, a viewpoint where we can observe reef sharks; from here we continue with a short walk to see the marine iguanas that inhabit in “Playa de los Perros”. Punta Estrada will also be visited. Return to Puerto Ayora. Note: shipping used in this excursion is a boat engine with capacity for 12 people. This tour only takes place Mondays, Wednesdays, Fridays, and Sundays. Day 3 : Breakfast at hotel. Day 4 : Breakfast at hotel.